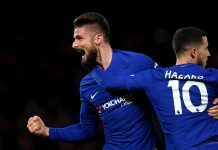 If there were any doubts about Chelsea’s ability to challenge for the Premier League title, quite of few of those doubts were erased on Saturday evening, as Chelsea defeated a very good Everton side 5-0 at Stamford Bridge. With Chelsea sitting in fourth place in the Premier League and Everton sitting in sixth, this was expected to be a tight affair. In truth, it wasn’t. Chelsea controlled and dominated Everton in every facet of the match. First half goals from Eden Hazard, Marcos Alonso, and Diego Costa pretty ended the match as a contest. In the second half, Hazard added his second and Pedro scored Chelsea’s fifth just to add some gloss to the final score line that really could have been much worse. The fact that Everton didn’t register their only until the 71st minute underlines the complete performance put in by Chelsea. With Idrissa Gueye suspended, Everton manager Ronald Koeman set his side up to mirror Chelsea’s 3-4-3 formation, playing Ashley Williams, Phil Jagielka, and Ramiro Funes Mori in his back three and bringing Tom Cleverley into the midfield. It might have been a mistake. From the opening whistle, Chelsea were much sharper than their opponents and for the opening 15 minutes, Everton couldn’t get near their opponents. Chelsea’s early dominance paid off after 19 minutes when Hazard found the net for his first goal of the match. Nemanja Matic caught Gareth Barry near the halfway line and the Chelsea counter attack, which has proved electric at times since the switch to 3-4-3. Costa found Hazard to his left, and the Belgian cut inside Williams and Seamus Coleman and fired inside the far post to give the Blues another early lead. Just 70 seconds later, Chelsea struck again. 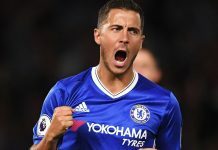 Hazard continued to show the brilliance that eluded him at times last season, skipping past Williams and Gareth Barry and releasing Pedro down the right. 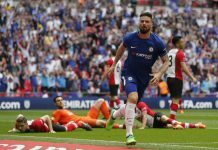 Pedro’s cross was a bit behind Costa, but Alonso galloped forward in support, and smashed the ball low and under Maarten Stekelenburg for his first goal for Chelsea. Koeman’s decision to play a back three looked to be a poor one, but before he could introduce Kevin Mirallas and switch to a back four, Victor Moses nearly grabbed a third for Chelsea when his volley thundered against the outside of the post from a cross from Alonso. Costa did grab Chelsea’s third before the end of the first half when Everton switched off on a corner, and Costa was able to smash home a volley from Nemanja Matic’s flick-on from the near post. Costa should have made the score 4-0 on the stroke of half-time when a pass from Pedro released him down the right. He skipped past Phil Jagielka but fired high and wide. Everton started the second half brightly with a good spell of possession and Chelsea perhaps having dropped their energy levels a bit. That spell was ended once again by a moment of brilliance from Everton’s chief tormentor on the night. After a move of seemingly endless passes, Hazard and Pedro combined down the right with Pedro playing a clever back-heel into the path of Hazard. The Belgian showed the instinct for goal that he sometimes keeps in his pocket to cut inside Williams once again and fire an early shot with his left foot that left Stekelenburg stranded on his spot. Pedro put in his best performance in a Chelsea shirt and resembled the player that was so integral for Barcelona, and he got his reward with Chelsea’s fifth. Costa nutmegged Jagielka on the half-way line and raced clear of the defender, eventually finding Hazard to his left. Hazard’s shot was parried right into the path of Pedro who was left with a simple tap-in. As the chants of “ole” rang out around Stamford Bridge in the closing moments, the Blues announced themselves as legitimate title challengers. Five straight victories in the Premier League since defeats to Liverpool and Arsenal and five clean sheets in those matches cannot be ignored. If Chelsea continue to reproduce these performances, they won’t be far off the top of the table. Previous articleWhat Is Chelsea Really Losing From The Failed Shot At The Champions League?